After quite many cloudy days with rain and wind we finally had some sunny days – and of course I took the opportunity to take some photos. Here is one taken in Fehrbelliner Strasse near Weinbergspark. 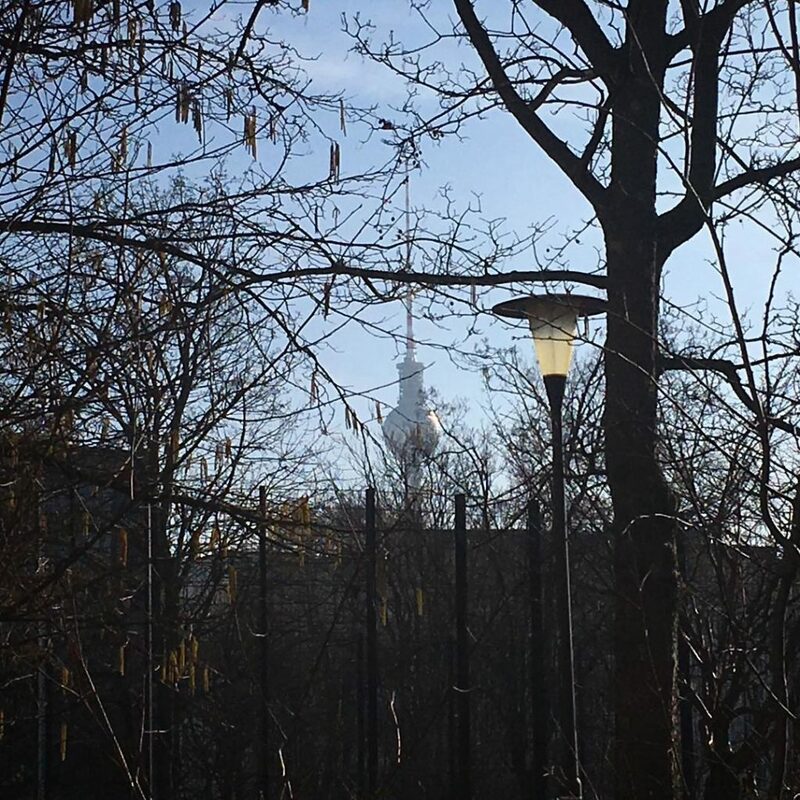 The sunlight is plaing with the old street lamp and in the distance the TV-Tower is beautiful as always. This entry was posted in February on 26. February 2019 by t.b.. Walking the streets of Berlin you may have noticed Cherry trees here and there. 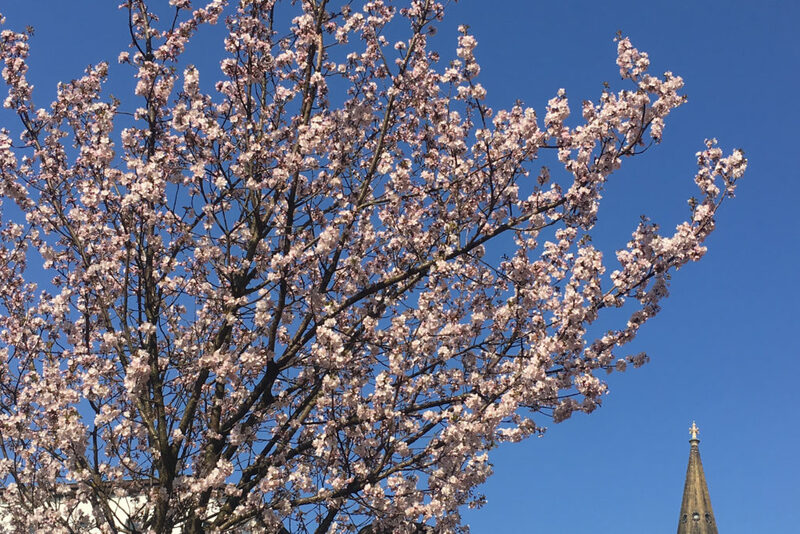 Especially during spring time, when the cherry trees begin to blossom, one may be left puzzled why there are so many cherry trees, and why they seem to be planted in rather distinct places. The answer is quite simple: most of the trees are a present from Japan. So they are actually original Japanese Cherry trees. This entry was posted in April, Mitte, Weather and tagged zionskirche on 30. April 2018 by t.b.. In the Summer taking a walk on Tempelhofer Feld is not really my thing. You can’t really hide from the sun – and at least for my taste there is just a bit too much going on. And that is a good thing – but I prefer my walks to be a bit more relaxed. While I do enjoy the walking, Tempelhofer Feld is probably more fun to experience when you have some wheels between you and planet earth – at least on the runways. 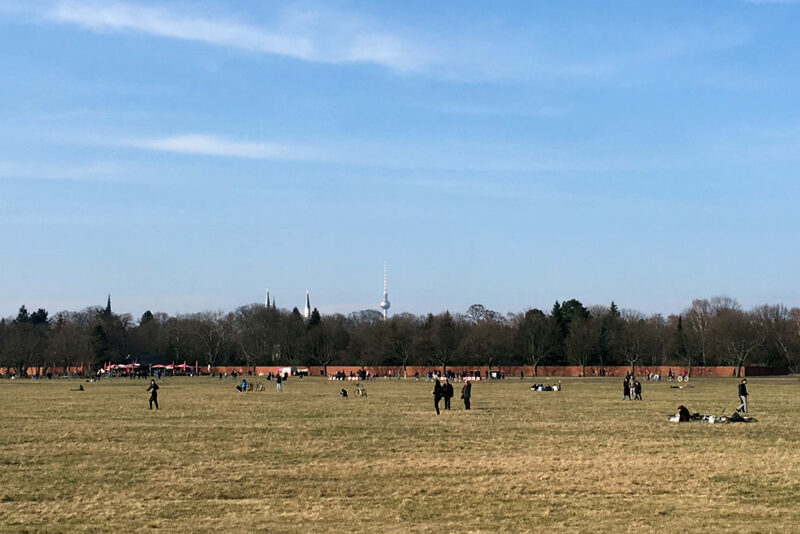 Anyways – last weekend we finally took a walk on Tempelhofer Feld – and it was really great. We had some sun to warm us walking the open field – and we saw some of the folks on wheels. And the Berliner Weisse tasted already a bit like Berlin Summer. Yay! Yes, weather can be nice in March – sometimes. Last Monday it was sunny. And I had the opportunity to go ‘shopping’ in Mitte. The Dircksenstrasse is basically connecting Alexanderplatz and Hackescher Markt – and there are some shops to visit. 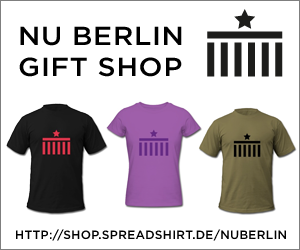 And you also have this iconic view to the Berlin TV-Tower. What a great Monday afternoon shopping experience! – even/especially for a local! 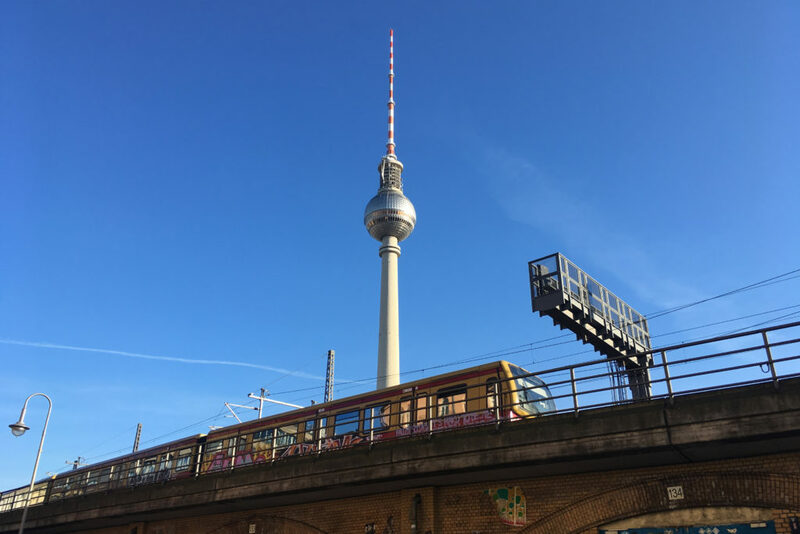 This entry was posted in March, Mitte, Weather and tagged S-Bahn, TV-Tower on 21. March 2018 by t.b.. Sometimes all you need to see is a sign of love – and I guess this is would it could look like: a sign in the middle of the sidewalk, featuring a heart with a little bit of this and a little bit of that. I basically pass this ‘sign of lover’ every day – and I really wonder how this ‘installation’ ended up being the way it is: very basic, very simple. 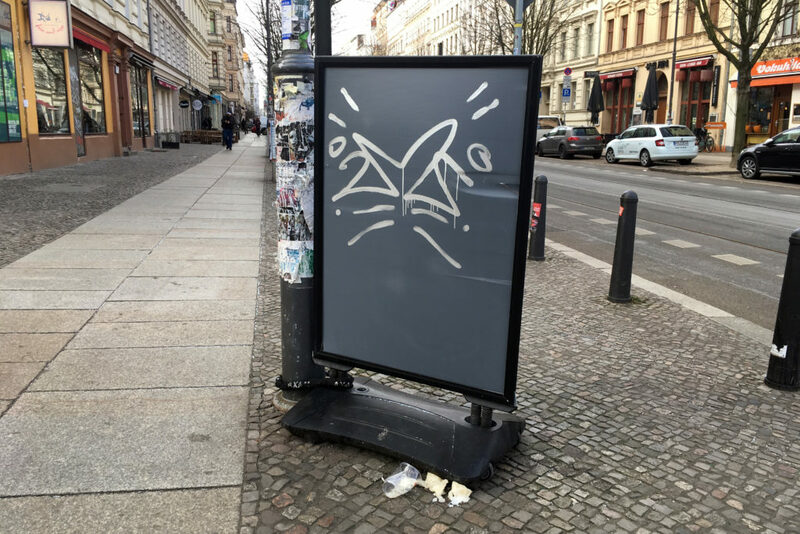 Just an empty sign with a streetart-style heart drawn on it. Well… the world would probably be a better place if only every billboard looked a bit more like this: a clear message with no real meaning. Greatness! 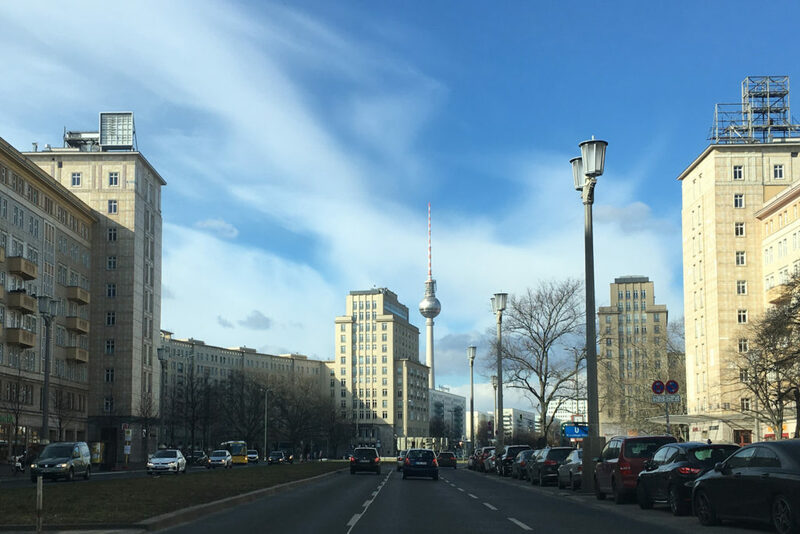 This entry was posted in February, Friedrichshain, Mitte and tagged TV-Tower on 27. February 2018 by t.b.. 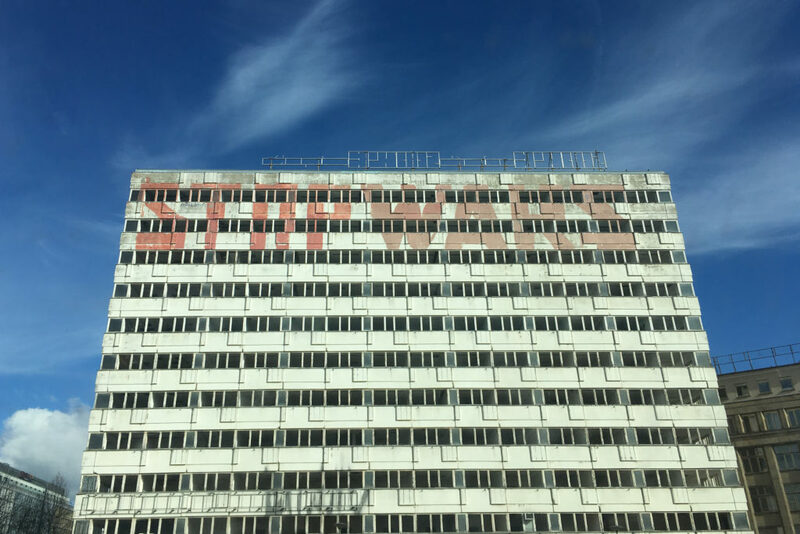 Walking down towards Karl-Marx-Allee, coming from Alexanderplatz, you may have seen the huge piece of streetart written on the building of the former Haus der Statistik (House of Statistics) at the corner of Otto-Braun-Strasse: “STOP WARS”. It is currently probably one of the most photographed pieces of streetart around here – although one may want to argue that it’s actually not art but a political statement. Anyways – stretching over three floors in height the piece it’s quite impressive. Just eight letters – rather simple message – but still so provocative. Brilliant. For about 8 years the building has been empty now. Chances are that in the near future the building will be used by the initiative Haus der Statistik (hausderstatistik.org) in cooperation with the district Mitte to provide a space for art, artists and various social projects in the very center of Berlin. Getting up early can pay off – especially when it’s a sunny day. It still was quite cold, but the view down Oderberger Strasse is very well worth getting cold hands. And in case you were ever wondering in what direction the Oderberger Strasse is pointing: it pretty much stretches quite accurately in a West-East direction – so you can see the sunrise on the one end of the street and the sunset on the other. 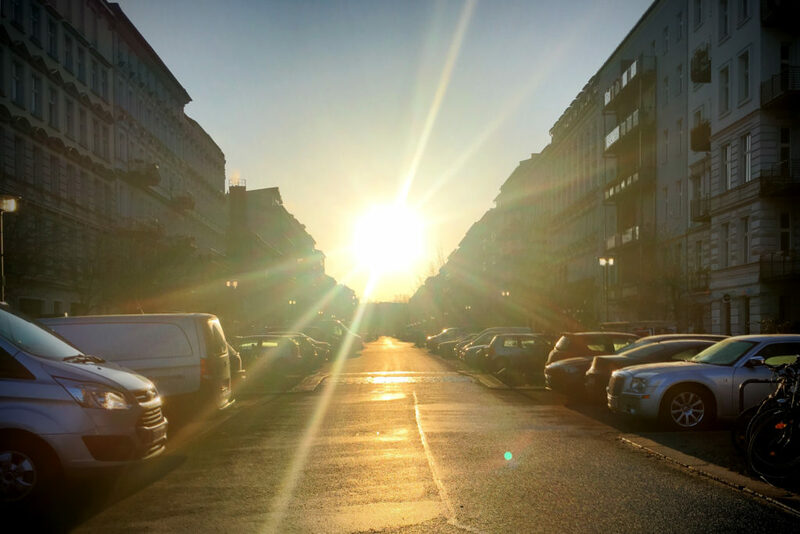 This entry was posted in February, Prenzlauer Berg, Weather and tagged sunshine on 23. February 2018 by t.b..